The Buick Enclave series began its history in 2008. While the differences between editions are minor, used Buick Enclave models have proved to be a better choice for individuals with a limited budget. 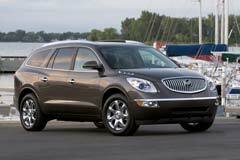 Being categorized as a full-size luxury SUV, the Enclave is available with four-wheel drive. The production models come with 3.6 liter V6 engines running at 275 HP or at 286 HP. All versions use a 6-speed automatic transmission. From the front, the car looks like a supersized sedan with an extra large grill, headlights and front bumper. The inside of the Buick features a generous storage space and high quality materials. It has all leather seats, ergonomically placed gauges and instruments and a large control panel in between the driver and front passenger. Across the interior, the designers used wood-like decorative elements on the dashboard, doors, driver’s wheel and central panel. 2018 Enclave AWD 4dr Essence 2018 Buick Enclave, Summit White with 11357 Miles available now! 2019 Enclave Premium Group 2019 Buick Enclave Premium Group 4 Miles Pepperdust Metallic 4D Sport Utility 3. 2016 Enclave Leather 2016 Buick Enclave Leather Summit White AVAILABLE NOW! !